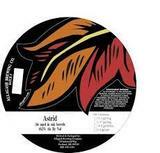 Astrid is a bright golden color with assertive aromas of spice, bread crust, apple, and fennel seed. We brew this saison with Pilsner, raw wheat, and Biscuit malt, and ferment it in stainless steel for a year with a blend of traditional saison yeast and Brettanomyces. After fermentation is complete, we transfer the beer to Scandinavian Aquavit barrels, where it ages for an additional eight months.